From Rt 107 (exit 41 LIE). 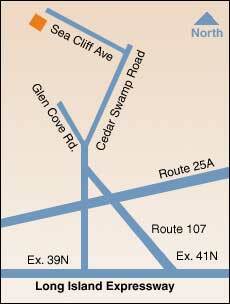 Go north on 107, keeping right at the fork with 106, until 107 merges with Glen Cove Road. After .8 miles, bear right at fork (there is a sign for both Sea Cliff and Cedar Swamp Road prior to the fork). Slightly after the fork there is a traffic light at a Land Rover Dealer. Make a left at that light onto Sea Cliff Avenue. Continue for 1.3 miles until you arrive at Sherman Art Conservation (#221) on your left after you pass the Post Office.